Pupils at Stedelijk Gymnasium Schiedam are being prepared for a future with robots. 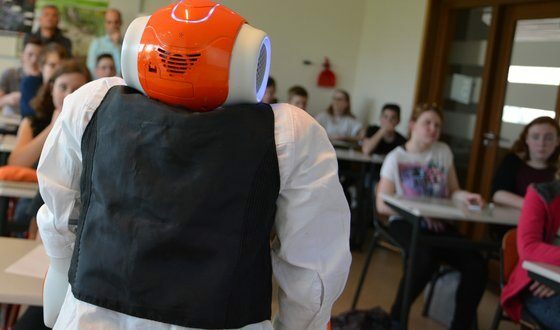 A Nao robot-tutor – programmed by TU Delft Robotics Institute associate Koen Hindriks – visited the third-graders at the school in order to teach them about robots. As part of the lesson, pupils got to program the Nao. As a follow-up to this lesson, the pupils will have to build their own robots – which will start roaming around the school on 21 June.